To the untrained eye, the Sarajevo Haggadah might seem like something one would pass over on first glance. The cover is battered, the binding beat up; the thing looks like it’s been through the war. In an era when the book as a material object has begun to recede from view, we may well move on to something shinier, more readily accessible: a gently used copy of “The Hunger Games,” perhaps, or a download of the latest, hottest book for our e-reader. But in passing over the worn, delicate volume, we’d be missing something extraordinary: the opportunity to come face to face with a medieval codex, the calfskin pages of which vibrate like a series of hallucinations, adorned with scenes from the Old Testament and illuminated with copper and gold. It’s the sort of beauty, found in unexpected places and times, that takes your breath away. And while we’re on the subject, it has been through the war. The story of this book inspired Geraldine Brooks, the Pulitzer Prize-winning author, to trace the tortuous and terrifying travels of the Sarajevo Haggadah in her 2008 novel “People of the Book.” Created in Barcelona sometime during the mid-14th century, the Haggadah becomes, in Brooks’s work, the main character in a quest to safeguard and transmit the beautiful and sacred. And now, with Passover soon upon us, the haggadah — the text recited on the first two nights of the Jewish holiday — is back in the air. Sure, most Seder celebrants will be unboxing the classic utilitarian version first published by Maxwell House Coffee in 1932. 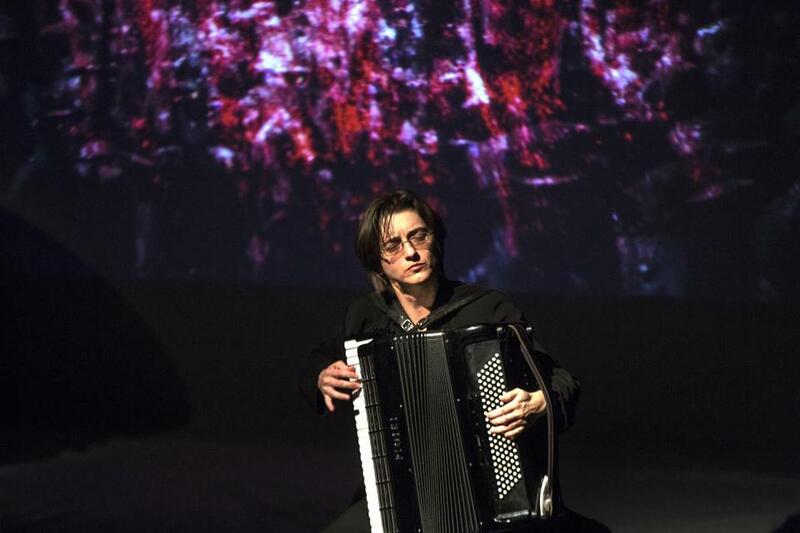 But a Bosnian composer and accordionist named Merima Kljuco, inspired by Brooks’s much-loved historical account, has dropped the Sarajevo version back into the art-loving zeitgeist. Her hourlong musical piece, “The Sarajevo Haggadah: Music of the Book,” which includes Kljuco on accordion, Seth Knopp on piano, and video work by Bart Woodstrup, was performed last week under the auspices of the Boston Jewish Music Festival and The New Center for Arts and Culture. The production is now traveling the country. Certainly over its lifetime the book has endured travels more challenging than a multi-leg flight to Dallas. In fact, that the Sarajevo Haggadah still exists verges on the miraculous. The combination of the object’s luminous beauty conjoined with its storied past — surviving more close calls than perhaps any other coveted art object — has inspired not only artists to create but Muslim librarians to risk their lives for a piece of Judaica. In 1994, Geraldine Brooks was a correspondent for the Wall Street Journal reporting on the siege of Sarajevo, capital of Bosnia-Herzogovina. The climate of this formerly thriving multi-ethnic city was almost universally grim. She and her compatriot wartime journalists, living in the rather inaptly named Holiday Inn, were encountering one horrifying story after another when something considerably brighter surfaced. The Sarajevo Haggadah, invaluable masterpiece of the Bosnian collections, had been located. Only later would it emerge that a Muslim librarian, Enver Imamovic, had rescued the codex and deposited it in a Sarajevo bank vault. Seven years later, in 2001, Brooks was on hand, along with many armed guards, when the book was restored in the European Union Bank. As Brooks describes it, the haggadah meant — and means — so much to Sarajevans across ethnicities that, during the siege, she heard stories of natives spending their last coins on replicas of the book, even as they subsisted on grass soup. Four years ago, “People of the Book” was pressed upon Merima Kljuco by a determined friend, who thought it brought to mind Kljuco’s difficult journey. “My own Exodus,” as she calls it. At the age of 14, Kljuco moved from a small city in western Bosnia to attend a conservatory for gifted musicians in Sarajevo. When she heard the accordion, as she likes to say, “I fell in love at first sound.” The war broke out when she was 18, and after that she spent two years in various refugee camps. She knew the story of the Sarajevo Haggadah when she lived there, and like many she was compelled by its story and symbolic power. Kljuco ended up in Rotterdam, where she found a conservatory that would take her in. The experience opened her eyes to the possibilities of the accordion beyond traditional folk music and onto sounds more contemporary. This is not to say she left Sarajevo behind. In 2012, her music poem “Sarajevo Red Line” was performed to an audience of 11,541 empty red chairs lining the main boulevard in the city, each chair representing a life lost to the siege. So when Brooks’s novel fell into her hands, she felt compelled to make something out of the book. As with Brooks, incandescent art inspired at least an attempt at making more art. In creating the piece, Kljuco called upon the Sephardic traditions of the different countries where the haggadah landed, but also, in the style of Bela Bartok, she added harmonies and clusters to more traditional melodies. The new composition was created in a residency at Yellow Barn, an international center for chamber music in Putney, Vt., with added invaluable support from the pianist Seth Knopp and the video artist Bart Woodstrup. The house was full. The stage was stark. Knopp sat at a grand piano to one side, Kljuco to the other holding her imposing free-bass accordion. Splitting the middle: a suspended white sheet meant to evoke the Seder table and act as screen. Kljuco’s piece is broken into a dozen movements, starting with The Creation, leaping to different eras in Spain, moving forward (and also back) to Exodus, and on to Italy, Austria, and Sarajevo. The composition closes with “La Bendision de Madre” — or “The Mother’s Prayer” — as found in a Sarajevo synagogue. The sound can be shatteringly delicate, a tinkling of piano keys, only to be broken by Knopp’s whipping of the Steinway’s innards with what looks like a metal lasso. Coins are dropped onto its strings. How to paint the Inquisition musically? With the echo of a Gregorian chant, then a threatening, even vicious attack on both instruments’ lower registers. The movement Stampita Italkim ushers in a brief spell of lightness, even comedy, as Knopp and Kljuco trade playful notes, only to break apart with the arrival of The Inquisitor. Kljuco did not meet Brooks until last week when “The Sarajevo Haggadah” was performed for the first time in Boston. And yet having read her novel four years ago, Kljuco was not surprised upon being introduced to the author of “People of the Book” that it felt like a reunion with an old friend.